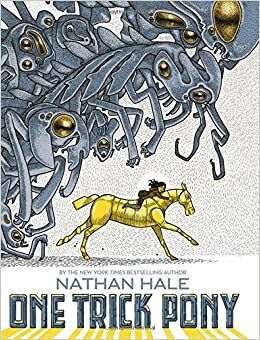 Summary: Nathan Hale takes a break from his Hazardous Tales graphic novels (relax, he has a new one coming out in November) to create a futuristic science fiction story. Much of Earth has been destroyed, and a small band of humans is trying to preserve what’s left of its culture and history. They live in a caravan that has to constantly move to avoid the alien Pipers that travel in bubbles and devour any technology they can find. At the beginning of the story, Strata, Auger, and Inby discover a cave filled with robots, including a robotic horse. Activating the robots attracts the Pipers, and the three kids barely escape on the horse. Their adventures have just begun as they struggle to return home, pursued by the aliens. Meanwhile, the caravan has gotten wind of the new Piper activity. There is a push to move on, but the parents of the three missing children don’t want to leave without them. 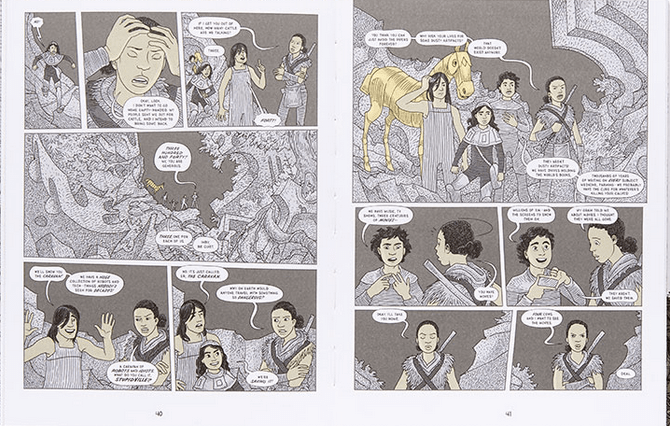 There are encounters with other groups of humans living in more primitive societies, and a final showdown when the aliens capture Strata and her horse. The action comes to a quick finish, indicating that this is most likely a stand-alone story rather than the first of a series. 128 pages; grades 3-7. Pros: Hale’s fans won’t be disappointed with this exciting adventure told with his trademark illustrations. There is enough action to keep a 13-year-old engaged, yet it is mild enough to be appropriate for an 8-year-old. Cons: The defeat of the aliens seemed way too easy, and the ending was a little too pat.